Your School Games - We love being active!! We are always working hard to make sure our school family is fit and healthy. 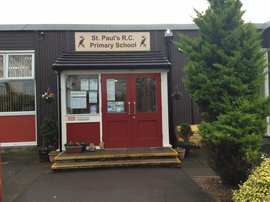 In St Paul's School we are very active. We have won the School games gold mark for the second year running. We also have been awarded the Youth Sport Trust Gold award. We are going to tell you some of things we do. The Sports Crew and PE Leaders are set up and lead lots of things in school. We show children that sport is not just a hobby but it is a lifestyle. We provide lots of different sports to all ages in our school. In our school sport is one of the most important things , what is more important than health and happiness. As sport comes first it is our job to get as many people as possible active. We have very active lunchtimes with lots going on. Our leaders run lots of Level 1 competitions at lunchtime and children love been involved. Dodgeball and football are always popular but we run lots of competitions so that all children can find something that they enjoy. At the moment it is basketball. We also run personal challenges. As the sports crew we lead all Level 1 competitions looking for children who are showing the spirit of the games. We all enjoy it.